Considering he's one of the biggest Whovians amongst the show's new crop of writers, Mark Gatiss's scripts have been something of a disappointment--never living up to the promise of his series 1 highlight "The Unquiet Dead". There was "The Idiot's Lantern" (awful), "Victory of the Daleks" (flawed) and "Night Terrors" (mediocre). 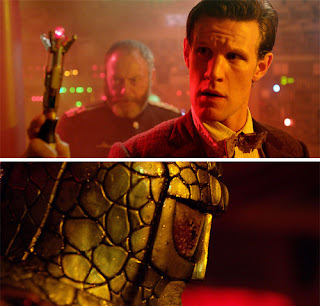 So I was just pleased "Cold War" was a mostly successful episode, despite pushing lots of over-familiar dramatic buttons, while reintroducing Classic Who fans to a familiar villain in Skaldak; an Ice Warrior, of the type encountered by Jon Pertwee's Doctor back in 1974. 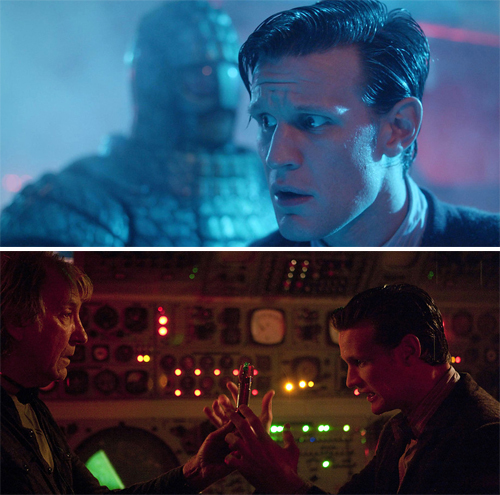 The Doctor (Matt Smith) and Clara (Jenna-Louise Coleman) chose a bad moments to appear aboard a Soviet submarine in 1983--which, let's be honest, is both a location and era you'd think a Time Lord would know to avoid. The sub's sinking to the sea bed, with Captain Zhukov (Liam Cunningham) helpless to stop it now a giant in bulbous armour's been defrosted by a shipmate and gone on a rampage. Naturally, The Doctor prevents a tragedy, but the actions of the sub's narrow-minded crew makes a firm enemy of the sole Ice Warrior; a venerated warrior amongst his Martian brethren, who starts plotting sweet revenge using the on-board nuclear missiles. "Cold War" was a simple but effective story, which was primarily a success because the updated Ice Warrior was a lot of fun to behold--both in its iconic armour, and when forced to abandon it and scurry around the sub. There were times when Skaldak's tendency to grab unwitting crewmen with its Gremlin-like hands, and rasp into their ears like Inspector Gadget's Doctor Claw, became slightly comical, but for the most part this episode was entertaining and quite tense. I also liked how the colour scheme shifted from cold icy blues to hot reds and oranges, as the Ice Warrior's threat escalated. I didn't quite understand why Skaldak was so angry with the Russian crew (seeing as they'd rescued him from an eternity of being stuck in a block of ice), and the story's attempts to echo the crazy situation of the Cold War (with "mutually assured destruction" the only thing preventing a global Armageddon), wasn't too successful in my eyes. In essence, this was a pretty simple episode where The Doctor was chasing down a dangerous alien, with the help of his plucky new companion and electro pop-loving David Warner (who worked with Gatiss on The League of Gentlemen movie). Tobias Menzies even appeared, having chanced his luck with a second BBC underwater drama after the awful 2010 series The Deep. And what do we make of Clara apparently struggling to remember details of her own life? That felt like a significant clue to the ongoing Clara mystery. Is her existence a falsity? There isn't much more to add, because the episode had fairly modest ambitions and intentions. The Ice Warrior costume design was an obvious improvement on their 1974 look (which wasn't hard), and everyone did exactly what was demanded of them. The idea to lose the TARDIS was welcome (as it's always irritated me how easily most problems could be solved with it around), and the eventual explanation even felt plausible. Might this idea the TARDIS vanishes when threatened become an accepted part of the show now? I hope so. Maybe The Doctor's sonic screwdriver could also malfunction more often, because without it you're often left wondering how anything would get done. I wish more stories had The Doctor's brilliance saving the day, rather than a reliance on the sonic screwdriver's myriad of abilities (it can now detonate nukes from afar). 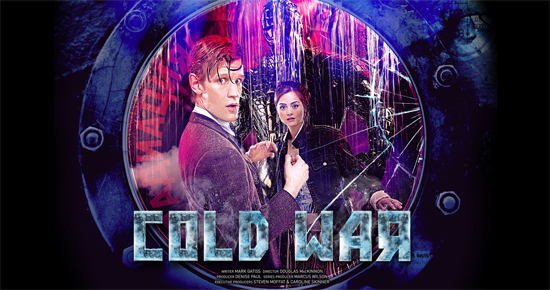 Overall, "Cold War" was one of the better episodes this season and easily Mark Gatiss's best effort since 2005's "The Unquiet Dead". It just wasn't anything we haven't seen before; more a series of comforting sci-fi tropes and perfunctory action beats.